Ms. Lisa Squillace is our head advisor. Without her, none of this would have been possible. She helped start the Torrington High School Science Club two years ago and got us involved in many amazing opportunities. She organized our Costa Rica trip and provided us with memories that will last a lifetime. She introduced us to the Bio Expo and has helped us extensively as our project progressed. She has given up much of her time to make sure that our club and each of us personally, are successful in all that we do. And for that we will always be grateful. Ms. Squillace got her B.S. in Medical Technology at Western Connecticut State University and her Masters for teacher’s education at Central Connecticut State University. She worked in the microbiologist department at St. Mary’s Hospital and Charlotte Hungerford Hospital. She was a QA specialist/microbiologist for Hershey Chocolate. She taught at Holy Cross High School for 6 years and has been a teacher of science at Torrington High School for 6 years. Her favorite flavor of ice cream is Coffee Heath bar Crunch. Mr. Randy Cogliser has been an Integrated Science teacher at Torrington High School for 16 years. He got his Bachelors Degree in Science from Dickenson State College in North Dakota and his Associate Degree in Electromechanical technology at the College of Science in North Dakota. He was a field engineer for 12 years and his favorite flavor of ice cream is vanilla. Mr. Cogliser was a chaperone on our Costa Rica trip and a very useful advisor for our project. Without him, our experiment would not have been possible. He helped us to come up with many of the variables that we needed to control and also provided us with much of the equipment we used. Dr. Jeffrey F. Shannon is an assistant student principal at Torrington High School. He got his Bachelors Degree in Science at the University of California in Santa Barbara. He got his PhD in MPhill Cell Biology in Pharmacology at Yale University. He is a coach of many sports teams including a baseball and a field hockey team. He was a former brew master and his favorite flavor of ice cream is Cherry Garcia. He helped guide our project from the beginning, giving us insight into the world of science. He also provided names of people and several other resources for us to check out for the project. Dr. Randolph V. Lewis received his Bachelor’s degree from California Tech in 1972. Several years later he received his Master’s degree and PhD degree from the University of California at San Diego. He was a postdoctoral fellow at the Roche Institute of Molecular Biology. 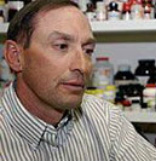 He joined the faculty at the University of Wyoming in 1980 and was Professor of Molecular Biology until 2011. He served as Department chair for five years and as a special assistant to the Vice President for Research. Dr. Lewis joined Utah State University in 2011 as USTAR Professor of Biology and in the Synthetic Bio Manufacturing Center. His group has published over 130 papers in a wide variety of journals and has written 16 book chapters. They have seven issued patents. He has had grants totaling over $31 million. Dr. Lewis has had 18 PhD and 3 M.S. students and currently has six PhD students and 16 undergraduates. His research focuses on spider silks and the proteins they are made from. In the past 20 years they identified, through DNA cloning, the proteins that make up all six of the different silks which spiders can make as well as the glue proteins. With that information they proposed the key parts of the proteins that are responsible for the high elasticity and the tensile strength of these fibers. Based on that data they constructed synthetic genes that make proteins in which the elastic or strength elements have been systematically varied. These proteins have been produced in bacteria, purified and are now being spun in to fibers to determine the effects of the different elements. They currently can produce fibers that are stronger than both Kevlar and steel. The goal of this work is to provide a method to produce fibers with custom designed strength and elasticity for applications such as ligament and tendon repair/replacement, high tech clothing, parachutes, etc. Their research has been featured on several TV shows including Discovery, Nova, BBC and CSI New York. We learned about Dr. Lewis from a video that we discovered on PBS about spider web silk. (See link below) We emailed him and he responded immediately, offering advice and guidance for our project. His work is very fascinating and he was of great use to us. He provided us with information on materials that we could use if actual spider silk was unavailable. He also pointed us towards Carolina Biological, which is the company that we got an orb weaving spider from. He even taught us how to “silk” a spider which requires an extreme amount of patience. University of Stuttgart in 2004, his Master’s degree in 2001 from Michigan Tech, and his Postdoctoral Scholar in 2005 from California Tech. Dr. Buehler has worked with a team of scientists at MIT to combine experiment with modeling to relate the nano-scale properties of spider silk to the large-scale integrity of spider webs. This experiment was designed to answer the long standing question of how spider webs are able to withstand hurricane-strength winds and remain intact. He and his colleagues developed an atomic-scale simulation of silk from the Nephila clavipes- a species of golden orb-web spider native to the warmer regions of the Americas, in order to examine the process of structural failure. It is this process that helps make the web so strong. “When we started testing our webs via simulation, we noticed that- no matter how we plucked and pulled- the web would only fail where we applied the load. This was very unexpected and exciting,” Buehler told physicsworld.com. “To confirm that this was the behavior of true webs, we found some webs in the natural environment and then plucked and pulled in the same manner. They failed just as our models had predicted.” Other research interests of Dr. Buehler include materials science and mechanics of natural and biological protein materials, how protein materials define our body and how they fail catastrophically (fracture, deformation, disease), large-scale atomistic modeling, protein based materials and biopolymers, interaction of chemistry and mechanics, bridging chemical scales to continuum theories of materials, modeling of bio-nano-materials phenomena, multiple-scale simulation, development and use of multi-scale simulation tools. We learned about Dr. Buehler from an article that we used as a source for our project. (See link below) He was the head of a very fascinating experiment about spider silk and when we emailed him, he was also very eager to help. He also provided us with information about different materials that we could use in place of spider silk. He was very knowledgeable about the way spider silk works and what makes it so strong. Mr. Ranieri is the owner of Costa Rican Resource, a program run out of Costa Rica, whose main goal is to get people out into nature to realize that each and every human on the planet is a part of our natural world. He has 11 years of experience as a raft guide in Costa Rica and is a certified Wilderness EMT and has been licensed in Vertical Rescue, Swift Water Rescue, Wilderness First Aid, and Wilderness First Response. He is an environmentalist and a global warming activist. Mr. Ranieri is a public transportation guru and is fluent in both English and Spanish. His topics of interest include tropical ecology, global warming, sustainable agriculture, permaculture farming, biomimicry, curing kids of Nature-Deficit Disorder. 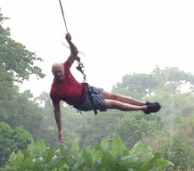 Mr. Ranieri is also Captain JAM, a superhero who helps get local Costa Rican’s out into nature. JAM stands for Jale Afuera Mae; in English: Lets Go Outside Dude! Captain JAM’s topics of interest include saving the Blue Planet, getting kids excited about nature, World's Strongest Man Competition, having coffee with Batman & the Avengers, and turning down contracts to Marvel Comics. Mr. Nuñez was a guide of ours in Costa Rica. He has a degree in Turismo Naturalist Guide and has 8 years of experience as a guide. He is smart and funny and is working on earning a degree in botany. His dream is to become a teacher and show students how important it is to take care of nature. He believes it is important to give back to the environment instead of simply taking from it. Mr. Nuñez is fluent in both English and Spanish. His topics of interest include Tropical Ecology, insects, mammals, ferns, Caribbean Costa Rica, and the effects of mono-culture on Costa Rica economy and environment. Mr. Araya was also a guide of ours in Costa Rica. He is a native of Sitio de Mata Turrialba. He is fluent in Spanish and English and is a nature lover. He grew up along the rivers of Costa Rica and has been a river guide for most of his life. He is an excellent cook and dreams of opening a MMA academy in Heredia, Costa Rica. He is also the stunt double for Captain JAM. Our Experience With Tom, Erick, and Daniel! Erick, Tom, and Daniel about the Costa Rican environment. It was an amazing experience. In the midst of creating lasting memories with friends, we learned valuable information about bio mimicry. The main topic we discussed was the golden orb spider, as that is creature our project is based off of. Golden orb spiders are everywhere in Costa Rica and they really are gentle giants. replicated, or could be, in our society. The Jesus Lizard and the Two Toed Sloth were just two of the animals we talked about. We may not be scientific advisers or experts but with a lot of hard work, some outside help and a team effort, we were able to complete this project.